Winthorpe, on the northern boundary of Newark, lies alongside the River Trent, and one of the earliest references to the village is that the Romans built a bridge across the Trent between Winthorpe and Collingham. In the ninth century the area between Newark and Lincoln was largely under Danish control, and the village was known as Wymphetorp. In the twelfth, century the living of Winthorpe was held by Aaron of Lincoln, but when the Jews were expelled his estate was seized by the Crown, and on January 21st, 1215, King John granted the manor and church of Winthorpe to Bishop Hugh of Lincoln, in perpetuity, for an annual payment of £20. The nearby village of Holme is mentioned in the mid-twelfth century when Lady Isobel, wife of Thomas de Muscam, granted some land and buildings in the "town of Hollum" to Helias de Wymphetorp. In the late thirteenth and early fourteenth century there are records of various crimes. Alan de Neusom, Rector of Wymthorpe, complained that Robert de Roldeston, bailiff of the Wapentake of Newark, did extort twelve pence and a quarter of barley. The jury found Robert not guilty. On another occasion, Walter Pete of Wynthorpe killed Nicholas Godeuin of Newark. Walter fled "and is to be outlawed." Another Walter, a cordwainer of Newark, and Henry Gerard of Wynthorpe, with two other Wynthorpe men, were charged with arson, various robberies and larcenies; all but Henry Gerard were acquitted, and he was hanged for several thefts. Then there is Peter de la Launde of Wynthorp who killed William Bruton by stabbing him in the stomach. Peter was taken to Nottingham gaol where he died. A man called William de Wynthorp had an ox valued at twelve shillings seized by tax-gatherers, and he was again in trouble when Agatha Chubbe sued him for half an acre of land. Even in those early days there were close ties between Winthorpe and Newark. In the fourteenth century Thomas Wynnethorpe had a house in Baldertongate, and in the next century we find that John, and later Thomas Wynnethorpe had properties in Barnbygate. In 1349 Alan Fleming founded a chantry for one secular chaplain to celebrate Divine Offices daily, and the first Chantry priest was a Laurence (?) Day de Wynthorpe. In 1547 various manors, including Wynthorpe, were given to the Crown by Bishop Henry of Lincoln, and in 1559 we find a Royal Commission sitting at Southwell for the deanery of Newark, to which the churchwardens of Wynthorp "doo present that their chauncell is uncoveryde." The records of Newark also state that in 1438 there was a "tax of a fifteenth" for the Wapentake of Newark to raise £87 .7. l½. plus another £8 because the district was poor. Wynthorpe's tax was £1.14.4. plus an extra 6/-d.
Land around Newark, from the sixteenth century onwards, began to be concentrated in the hands of certain families. In 1506 Thomas Meryng, Esquire, and Thomas Skendelby owned land in Wynthorpe and other villages round Newark. 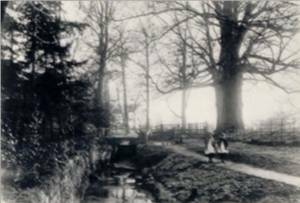 In the mid-sixteenth century there was a long law-suit about land at Wynthorpe belonging to the Spaforthe family, John Spaforthe having committed suicide in a well at Wynthorpe. In 1579 Queen Elizabeth granted land in Wynthorpe to Henry Fullwood, and in the early seventeenth century Sir Francis Leeke of the Friary, Newark, owned lands at Collingham, Holme and Winthorpe. 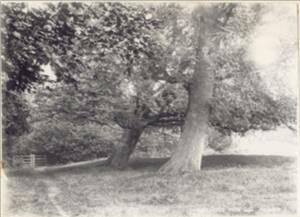 In the eighteenth century we find in Winthorpe the extensive estate of Dr. Robert Taylor and Roger Pocklington of Winthorpe Hall (of these there is more detail elsewhere in the scrapbook), and some degree of order was brought into land tenure by the Enclosure Award of 1776. In 1739 the corporation of Newark had mortgaged all their real estate, including the advowson of Winthorpe, to Richard Twells for £1,560. After default on payment, the advowson of Winthorpe was purchased by Dr. Taylor for £670, and in 1766 Roger Pocklington acquired it in turn for £600. 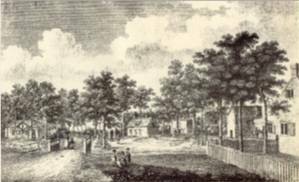 In 1800 commissioners were appointed to share out about 400 acres of common land. They were also to erect a "sluice in the drain" (probably an arm of the Fleet) dividing the open meadows from Winthorpe village, and to strengthen the Trent bank to prevent flooding. 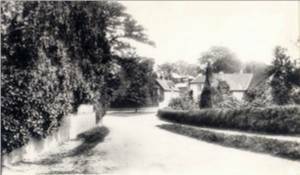 In 1855 Sir William Gilstrap, Bart., bought a country house with 20 acres of land at Winthorpe, and lived there until 1862 when he moved to Bury St. Edmunds. Lady Godiva as Lord of the Manor of Newark in the eleventh century, and its first recorded owner, had had jurisdiction in sixteen parishes including Wynthorpe. In 1541 the "Guild of Newark" appointed three aldermen from Wynthorpe, being Reginaldus Crosse, Johannes Smythe and Rolandus Spalton. We may by then have become somewhat more law-abiding, because in the Hallmete or Lord's Court in 1579 the Wynthorpe frankpledge * had nothing to report. In 1604 the Hallmete was held in Winthorpe because of an outbreak of the plague in Newark. Winthorpe saw much activity during the Civil War. Colonel King of the Parliamentary army was quartered here in 1644, and in 1645, during the second siege of Newark, we had Colonel Henry Gray. Because of Newark's support of the Royalists it was rewarded in 1677 by Charles 11, who granted to the mayor and corporation the right and patronage of the rectory of Winthorpe (the advowson later mortgaged to Richard Twells). In 1677 also, Newark was granted its sixth charter and included in this was the right to return two members of parliament. However, objections were raised to the method of election, and petitions from Balderton and Winthorpe prevented the members from taking their seats and further elections had to be held. There are many references to Winthorpe in various old Wills. In 1452 Agnes Shawe, widow of Newark, gave 3/4d to several churches, including Wynthorpe. In 1460 a witness to the Will of John Low, chaplain, was William Austely (or Ousteby) rector of Wynthorp. In 1550 Robert Fulwood, yeoman, left 3/- to each of several villages, including Wynthorp, for the poor. At about this time William Philipotte left 5/- to the poor people of Wynthorpe town to pray for his soul. He also left a further 6/8 "for the common worke of Wynthorpe." 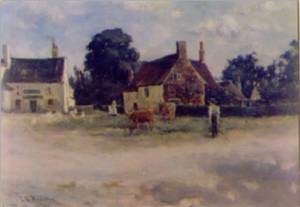 His goods, movable and unmovable, in Newark, Wynthorpe or Bathley he left to his wife Elizabeth; and lands within the towne and fields of Wynthorpe, which he had purchased from William Hog, were bequeathed to Anne Lillie after the death of his wife. * Note :- The "Frank Pledge" refers to the custom that each member of a body of ten men should pledge his word for the right conduct of the rest. This was inquired into at the Court. From "History of Newark" by Cornelius Brown. 1971. While this scrapbook was being assembled, Mrs. R. Marson gave us a coin, which her late husband dug up in their garden some years ago. The coin was submitted to Mr. H.V. Radcliffe at Newark Museum, and it was identified as "Roman Coin. Yellow bronze Sestertius (much worn) of a late 1st/early 2nd Century A.D. emperor." 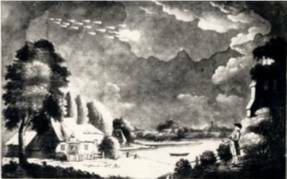 This picture by Henry Robinson, schoolmaster and presented to Roger Pocklington of Winthorpe Hall is an accurate representation of a meteor which was seen over Winthorpe on August 18th 1783. It at first appeared as one Ball of Fire, but in a few seconds broke into many small ones. The course was from N.W. to S.E. Winthorpe in Early Norman Times in Volume 4.